If you're accustomed to eating oatmeal made from rolled oats, you may be surprised at the chewy texture and nutty flavor of steel-cut oats. Steel-cut oats are made from the whole oat, which is cut into small chunks. Because the oats are a whole grain, the cereal is rich in vitamins, minerals and fiber. Although steel-cut oats take longer to cook, the health benefits and flavor are worth the extra time. 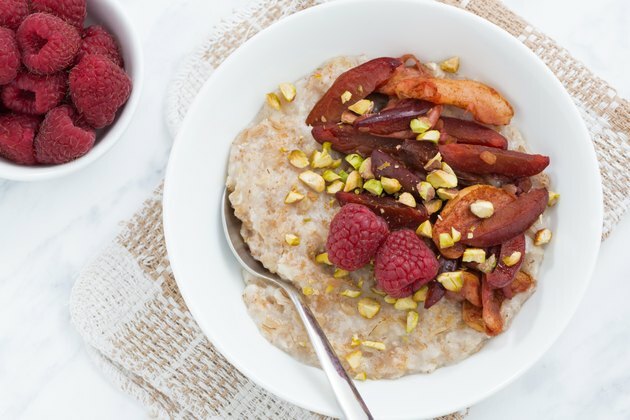 If your mornings don't allow time to cook steel-cut oats, make a large batch, then freeze the oatmeal into serving-sized portions for quick reheating. Bring water to a boil in a large saucepan, then stir in the steel-cut oats and a pinch of salt. For two to four servings, use 3 cups of water and 1 cup of oatmeal. To make a larger batch, adjust the amounts of water and steel-cut oats proportionately. Reduce the heat to "Low" to bring the mixture to a simmer. Cook the oats for 20 minutes. For softer oatmeal, cook the oats for up to 30 minutes. Spoon the oatmeal into a serving-sized container, such as a clean margarine or yogurt container. Place the lid securely on the container and put the container into the freezer. You can also freeze oatmeal in an ice cube tray lined with plastic wrap. Once frozen, pop the cubes from the tray and transfer them into a resealable plastic bag. One cube is just right for a toddler, and two to four cubes will satisfy an adult. Defrost frozen steel-cut oats in the microwave. Once defrosted, heat the oatmeal in the microwave or a small saucepan on your stove. Stir in sweeteners, such as honey, brown or granulated sugar and extra flavorings such as cinnamon or vanilla. If desired, add raisins or other fruit. Add a small amount of milk or cream if the oatmeal is too thick. If you like buttery oatmeal, melt 1 tbsp. of butter in the saucepan and lightly toast the oats before adding the water. Which Oats Are Good for Losing Weight?